Although the Second World War ended in 1945, the American presence in West Germany lasted for many decades after the peace signing. Throughout the years 1944 – 1970, American soldiers had to fulfill several roles in Germany, and American soldiers from all walks of life had to be trained, guided and shaped accordingly, without losing sight of what it meant to be an American. 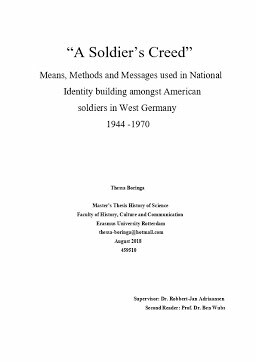 To gain a better understanding of this American identity building process, this thesis focuses on how national identity amongst American soldiers in West Germany was constructed and maintained. I have researched the top-down means, methods and message provided to the soldier by the US Department of Defense, which were intended to influence their behavior, mindset and self-image. I conducted a narrative analysis of primary (military) sources, such as books, motion pictures, radio, magazines and pamphlets, and paid special attention to the connection between narration and visual representations in those sources. The thesis is divided into three thematic and chronologic chapters, each with a geopolitical change or shift which highly affected national identity construction amongst the American soldiers. These being, in order, the transition from an conquering force to an occupation force in the 1940s, the shift of enemies and allies in the 1950s, and the shift in how others saw the United States’ role in world affairs in the 1960s. Especially the methods othering, reversed othering, targeted legislation and reminding soldiers of unifying cultural traits have been extensively investigated, as were the general messages provided to the soldiers concerning national identity. This thesis aims to contribute to American History writing, as well as to the discourse surrounding Othering and National Identity.